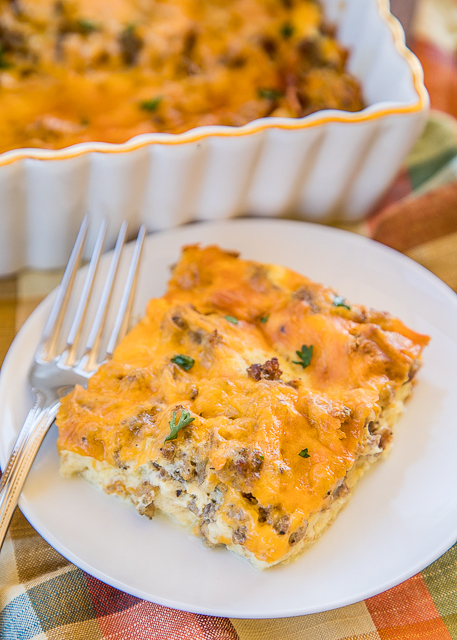 This Low-Fat Sausage Breakfast Casserole is a favorite in our house. With a few simple swaps, I drastically lowered the fat of our usual breakfast casserole and didn't have to sacrifice any flavor. Turkey sausage, low-fat cheddar cheese, egg beaters, and whole wheat bread. 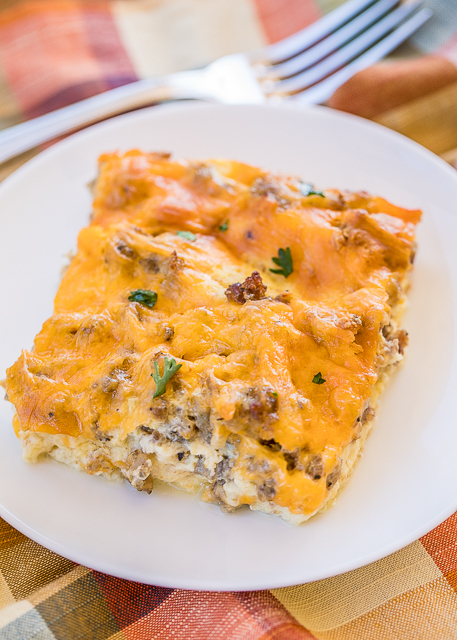 This Low-Fat Sausage Breakfast Casserole needs to be made the night before baking. I just make it before I go to bed and it is ready to bake in the morning. I’ve never frozen this, but I think it would be fine to freeze it unbaked or baked. If you freeze this unbaked, just make sure to thaw it out before baking. 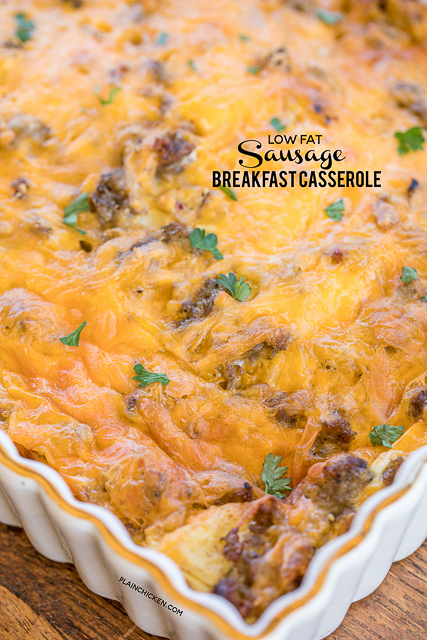 This Low-Fat Sausage Breakfast Casserole is great for breakfast, lunch or dinner. All you need is some fruit and/or a salad and you are set. 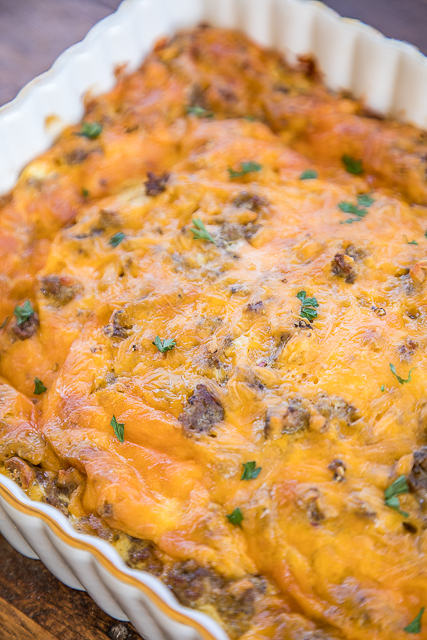 We eat this casserole at least once a month. I LOVE the swaps to lower the fat. No one will ever know this is low fat. I didn’t tell Chicken Legs and he had no idea. Give this a try ASAP! I promise it will be a hit! Cook sausage in skillet over medium-high heat until crumbled and no longer pink. Drain any fat. Cut bread into cubes and place in bottom of prepared pan. Sprinkle cooked sausage on top of bread cubes. Top sausage with shredded cheese. Whisk together egg beaters, egg, milk, salt and pepper. 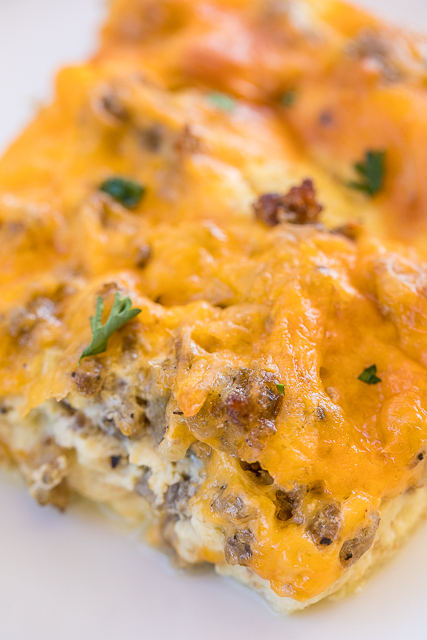 Pour egg mixture over sausage and cheese.